Line a baking sheet with parchment paper. 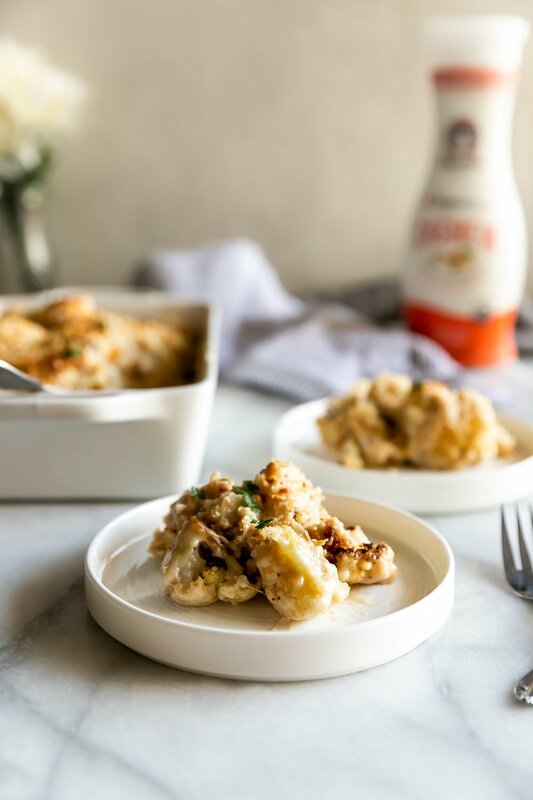 Arrange cauliflower florets on a baking sheet. Drizzle with olive oil, salt and pepper to taste. Toss well and roast for 15-20 minutes until florets are tender and browned. Remove from oven and reduce heat to 375 degrees F.
In a saucepan, melt butter over low heat. Add the flour and whisk for 1 minute. Pour the Califia Farms Organic Cashew Homestyle Nutmilk and 1/4 cup of nutritional yeast into the saucepan. Let it come to a boil while whisking constantly until thickened. Remove from heat. Stir in black pepper, garlic powder, smoked paprika, and nutmeg. Set aside. Transfer roasted cauliflower florets to a greased baking dish. Pour the sauce evenly on top. Sprinkle remaining nutritional yeast and breadcrumbs evenly over the top. Bake for 25-30 minutes or until top is browned. Serve immediately.